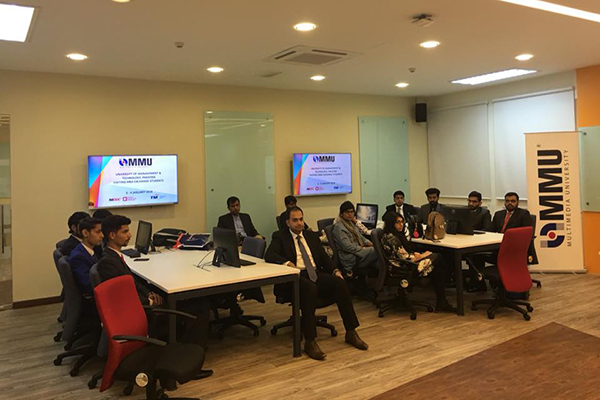 Student of the MBA program at the School of Business and Economics (SBE), UMT, visited Faculty of Business, Multimedia University (MMU), Malaysia. The visit happened under the umbrella of student exchange program between UMT and MMU. The studens were accompanied by Dr Yasir Rasheed, Assistant Professor, SBE. This collaboration created an opportunity for students to explore international horizons and enrich their experience through networking with MMU. It is a concrete step in nurturing the far reaching collaboration between the two schools and provides the framework for the delivery of future key areas to build capacity to cope with the emerging challenges. SBE is the one of the schools of UMT that provides global exposure to the students for obtaining up-to-date and globally competitive skills and insights of management and technology. SBE provides an excellent education platform to lead our students to a fulfilled life with wisdom and responsibility, winning worldwide recognition and admiration. It is worth mentioning that MMU was ranked amongst the top 151-200 universities worldwide by QS World University Rankings in 2015, 2016, and 2017 consecutively. It was also ranked 193 and 179 by QS Asian University Rankings in 2016 and 2017 respectively.